After unveiling high end smartphones for the masse, its time to try something new, maybe try experimentingwith feature phones. The Nokia 230 is Microsoft’s latest internet-enabled feature phone which comes with an all new design and is the first ever having a decent selfie camera. 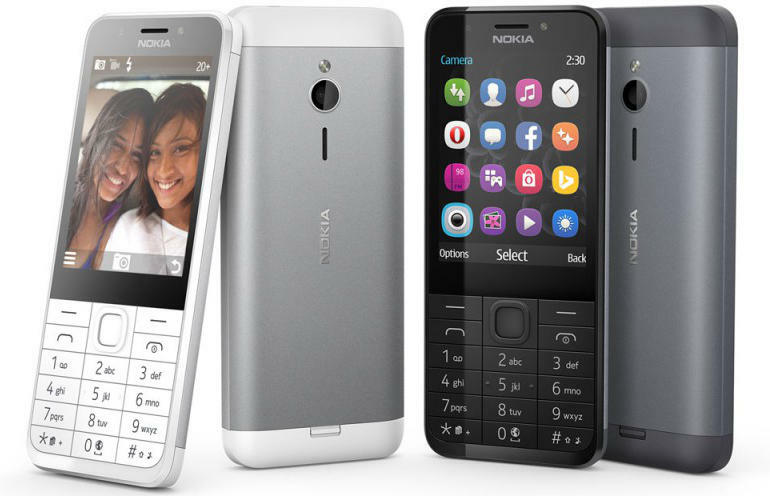 Normally, we tend to see the feature phones having a camera at only the back, but the all new Nokia 230 which carries a price tag of $55 has, not one, but two camera at both ends. To put a cherry on the top for the camera side, each of the cameras is supported by a LED Flash. If you are thinking the new feature phones will be coming in various colors, you’re wrong. Microsoft is keeping this feature phone in a serious color tone of only black or white. The back of the phone is aluminium which is wedged between two bars at the top of the phone and the bottom matches with the main colour options i.e black and white. The end result is a brilliant finish compared to the previous feature phones. As for the specs, the device features 2.8-inch display, 1,200mAh battery with a maximum standby time of 27 days, 16MB RAM, FM Radio, MP3 Player which can use memory from the memory slot supporting upto 32GB storage. The Nokia 230, despite from being just a feature phone instead of an Android one, can also run a number of apps such as Whatsapp, Facebook an games from Opera Store. Although the price of the device stands at $55 which is close to the $70 Lumia 430 available in the market which will also be eligible for Windows 10 upgrade. The Nokia 230 and a dual SIM variant go on sale in December in India, Asia and the Middle East, with other markets to follow in 2016. 4 Months with the 3M privacy filter and still using it!